"Salwa Judum is peaceful. We support it"
The movement is not run by the government. Salwa Judum is an initiative of the tribal communities to fight Naxals. Tribals have in the past taken security measures themselves but not continued due to lack of state support. We are providing security and facilities to them. Salwa Judum is a peaceful movement against Naxals and we completely support it. We need to examine the issue at a national level and launch an integrated action plan. Cooperation among states, joint operations for example, is imperative. Training is a weak area. We need people who are physically and mentally fit to take on guerilla warfare. crpf's Cobra (Commando Batallion for Resolute Action) battalion, like in other states, has been implemented in Chhattisgarh. But we need a training institute for the personnel. We announced we will not acquire agricultural land for industrialization. We meant land that is either irrigated or on which farmers practice multi cropping. We want to make the most of the land where productivity is marginal and is in a way barren. We want to ensure no one acquires productive land. It would be difficult to give an exact estimate. Nearly half of the total area in Chhattisgarh is under forest cover (6 per cent of which includes revenue land). Almost 42-44 per cent is under agriculture and the rest, 6-8 per cent, which cannot be used for agriculture or is not being cultivated, is what we are trying to use for industries. The state has three kinds of land: agriculture, revenue and village common land. These have different methods of approval. We will make use of all kinds of land for agriculture, industry, dams and mines. Mines are all in the hilly areas where farming is not done. We are concentrating on giving industry land in such areas. All acquisition will be done after a panchayat concerned approves it. 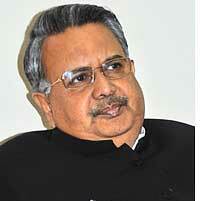 All land acquisition has been done properly in Chhattisgarh. Gram sabhas and public hearings are conducted. There is never a 100 per cent consensus but when there is a 51 per cent consensus the district administration proceeds with the acquisition. Cement and steel plants such as balco, Navin and Monet are expanding. Steel Authority of India Ltd is increasing its capacity from 400,000 million tonnes to 700,000 million tonnes. Some new companies are also showing interest. Our government has never claimed that we are giving rice to bpl families. We have maintained we would give rice to poor families. Poor families are those who were categorized bpl either in 1991, 1999 or 2002. Some of them might have made it to the apl category under the Centre's standards. So, we added another 1.7 million families whom we consider poor. We have given them ration cards, not bpl cards. Chhattisgarh has done well. Growth in agriculture between 2002 and 2007 was 7.1 per cent. The per capita income has increased from Rs 10,000 in 2000 to Rs 29,000 in 2008. Distributing rice at Rs 3 per kg was not the only reason we won the elections. We offered them food security. We will provide 35 kg of rice at Re 1 per kg to 700,000 families under the Antyodaya yojana, which is for the poorest of the poor. For others, it will be rice at Rs 2 per kg. We have announced a bonus of Rs 270 per quintal of paddy (Rs 220 by the state and Rs 50 by the centre). Two kg salt every month will be made available to 3.7 million families for free. It is a success, with some loopholes, yes. We are trying to reach out to 3.7 million families. When the market rate of rice was Rs 16 per kg, we were distributing it at Rs 3 per kg. We have beefed up the monitoring of public distribution system and hope to plug the loopholes. We have a gdp of around 7.2 per cent. As the overall gdp structure increases, the share of agriculture and the allied sectors will amount to at least 10 per cent. We are also providing complete assistance to tribals for housing. We will construct 7,890 houses. Tribals will have access to irrigation and get land deeds. After their children complete class 12, they will be given employment, without competition.